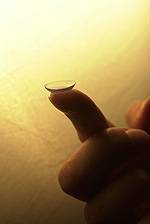 What is the difference between an eye exam geared towards wearers of glasses and an eye exam geared towards wearers of contact lens? What can be expected during a contact lens evaluation? Dr. Coker: A comprehensive eye examination geared towards an eyeglasses wearer includes checking vision with and without current glasses, checking eye pressures, peripheral vision, refraction (determine the strength of glasses necessary to see our best), and health of the front and back of the eye.